The installation is a response to formal concepts, other artists' work, and its physical context. I am most basically investigating how we might experience the juxtaposition of rectilinear and non-rectilinear form. I was moved by the torqued ellipses of Richard Serra and worked to recreate forms from extruded and torqued shapes. I borrow from Fred Sandback the elegant expression of three dimensionality with taught suspended string. I split the gallery space, which functions as a major thoroughfare, across its main diagonal path of circulation. On one side the suspended cord is left bare, only implying a surface. On the other, the cord is covered in paper and flooded with neon and pink light. The bare side exhibits models from the preliminary stage of this project; the covered side is meant as an interaction with light and space. 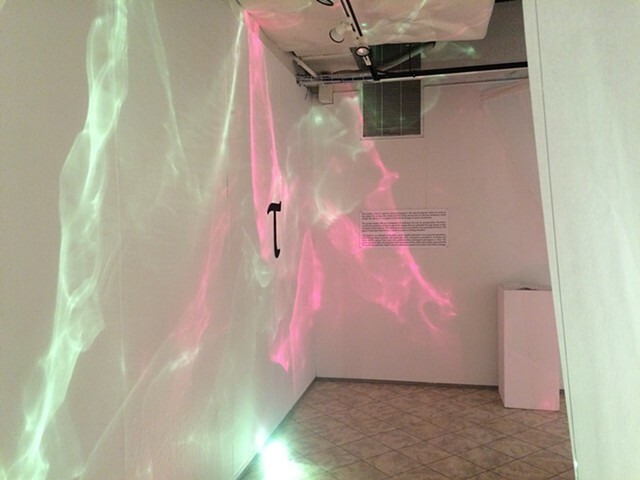 The installation as a whole is meant to not only invoke sensation but also to demonstrate a complex connection between sense perception and spatial expectation across time.